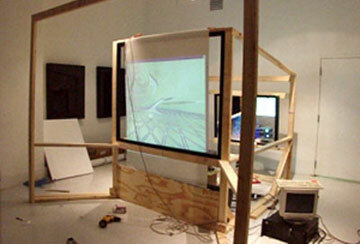 The VR Portal is a configurable virtual reality installation system. The compelling experience is derived from its immersive screen, head-tracked 3D computer graphics and real-time interactivity. The large screen ensures the participants' feeling of intense immersion while the tracking system matches the display to the user's perspective. The input device enables participants to interact and affect the virtual spaces while a microphone gives users the ability to control the experience through speech. Two speakers fill the local, physical space with virtual sounds. Each VR Portal also has the capacity to network with other VR Portals enabling geographically distant users to collaborate and interact in shared virtual environments. The VR Portal is partially comprised of two workstations running the Linux operating system. One machine drives the stereo display, receiving data from the second computer which takes care of the tracking information. Two projectors with polarizing filters project images for each eye onto a special screen. When the user dons a pair of stereo glasses, each eye sees only one image and the brain fuses the two into a three-dimensional immersive environment. Applied Interactives members have been involved in research to advance Virtual Reality as an artistic medium. We were involved with the Electronic Visualization Laboratory at the University of Illinois at Chicago in the development of new auto-stereoscopic VR systems and optical tracking systems. In addition, we developed many useful extensions for the ygdrasil virtual reality software. Wehave also worked on developing an infrastructure for integrating physical sensors into our virtual environment using microcontrollers. It is still our goal to provide less expensive and more accessable technology to artists for developing and exhibiting VR artwork.